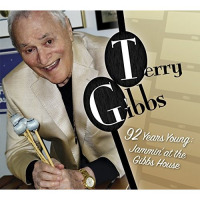 For a brief moment, put aside the fact that legendary vibraphonist Terry Gibbs is now ninety-two years old. Just listen to the YouTube video at the bottom of this piecelyrical, swinging, and vibrant as any jazz out thereand take it in. It's something beautiful, right? Nothing radical or groundbreaking at all, but most certainly jazz of the highest order. Now, go back to Gibbs' age. At ninety-two, he's at a point where most of his peers are either gone from this earth or lacking the vitality that served them well in their younger years. Few make it to that stage and far fewer have much to celebrate if they do. But Gibbs is that one-in-a-million man, loving life, smiling away, and still making his mark as one of the greatest vibraphonists of all time. Gibbs essentially went into retirement around the time that he gained nonagenarian status, but when a one-off jam session at his house yielded a YouTube video that went viral overnight, the idea of making another album surfaced. Whaling City Sound's Neal Weiss approached him about it and, despite the fact that Gibbs had declined Weiss' offers to record in the recent past, he agreed. There was just one condition: the vibes legend didn't want to go into a studio, so he offered up the idea of recording a jam session in his own home. Weiss was game for that, the plans were put together, the music was recorded and mastered, and here we have itor about half of it, anyway. 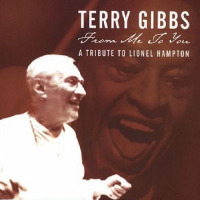 Over the course of four days in 2016, Gibbs and his band for the occasionJohn Campbell on piano, Mike Gurrola on bass, and son-labelmate Gerry Gibbs on drumsrecorded thirty-one songs. Gibbs picked the performances he liked best, and that's what made it onto the album. When taken with the aforementioned information, what makes this recording all the more remarkable is the fact that there were no written arrangements and most everything was done in a single take. In the end, musical self-assuredness coupled with spontaneity helped to create pure perfection. 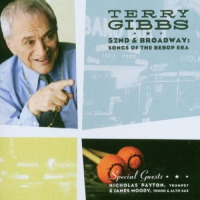 That's apparent in Campbell's smart juxtaposition of a familiar bebop strain against Gibbs' "Back Home In Indiana" melody line, the vibraphonist's classy and glowing cadenza at the tail end of "What's New?," some playfully traded fours between both Gibbs men in various spots, and the interlaced piano and vibraphone streams on "Yardbird Suite." And that's merely a handful of bright moments on an album overflowing with them. 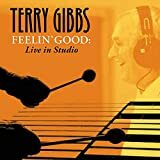 Time may remain an unbeatable adversary for all mankind, but it's beautifully clear that Terry Gibbs has yet to acknowledge and accept that inevitable truth. Long may his mallets move. Track Listing: Back Home In Indiana; Yesterdays; The Shadow Of Your Smile; What's New? ; Take The "A" Train; Blues For Hampp; I'm Getting Sentimental Over You; Between The Devil And The Deep Blue Sea; Autumn Leaves; Yardbird Suite; All The Things You Are; Just Some G Minor BLues; Imagination; Here It Is; Closing Remarks. 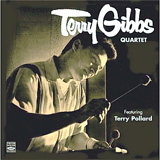 Personnel: Terry Gibbs: vibraphone; Gerry Gibbs: drums; John Campbell: piano; Mike Gurrola: bass.